This chapter describes the isolation, culture, and staining of osteoclasts. The key advantages of this assay are that it allows direct measurement of osteoclast number, bone resorption, as well as yielding good quantities of osteoclasts at defined stages of formation for molecular analysis. An additional focus of this chapter will be the generation of osteoclasts from less conventional animal species and cell lines. 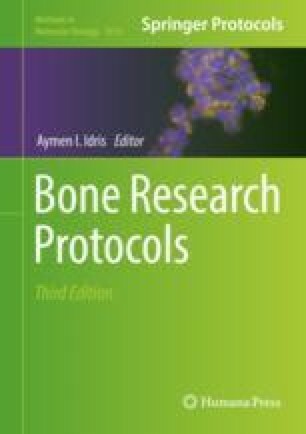 We are grateful to Prof Rodolfo Amprino and Prof Gastone Marotti for introducing us into the bone field, to Prof Pier Carlo Marchisio for the instrumental collaboration in the discovery of the podosomes, and to Prof Steven L. Teitelbaum and Prof Arnold J. Kahn, who believed in our chicken osteoclast isolation method and made it possible to disseminate this knowledge to the bone community.